How do I know how many flues I have? A flue is a venting system, each system needs its own so If you heat your home with oil or gas and have a fireplace you would have two flues. Often times they are in one chimney so if you were to look down the chimney it would be separated into two venting system inside one chimney. That question really depends on how often you burn, what you burn and how you burn. A wood stove typically needs to be cleaned more often than a fireplace because most homeowners use woodstoves as a heating source where as a fireplace is used mostly for a decorative purpose. A good rule is every cord of wood. Oil and gas should be at least inspected annually. 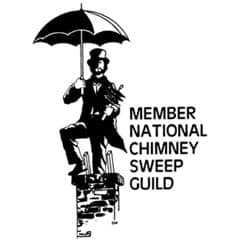 Gas burns clean, but lets off a lot of moisture so a professional chimney sweep is going to look for any debris that could fall into the chimney, cracks in the liner, or even animals nesting in the chimney that could block up the flue and cause carbon monoxide to enter the home. Every situation is unique, no two chimneys are the same. The standard cleaning process for a fireplace flue would to be to come into the home , tarp off the firebox so that no soot escapes into your home. The tech would then go on to the roof, and using his rods and brushes would proceed to sweep from the top down. As soon as the flue has been properly cleaned the technician will then return inside the home and using a high powered vacuum, remove any soot that has been brushed down. For a furnace flue cleaning, the technician will begin on the roof brushing any debris to the bottom and then he will go into the basement and disconnect the pipe from the furnace to the flue and vacuum 2-3 feet below that connecting pipe. When this process is completed the technician will make sure that the pipe is properly resealed to the flue. If for some reason there was no way that we could access the roof to do the cleaning, the technicians are trained to do the full cleaning from inside the home. As stated earlier, as hard as we try not to make errors, they do occur. However our company guarantees that we will take every precaution to insure the safety and cleanliness of your home, from the time we enter until the time we leave. and again we are fully insured so that you can rest assured knowing that if anything did occur while in your home we would make sure to take care of it. A chimney liner is like the exhaust on your vehicle if it does not function properly or there isn’t one you and your family would inhale toxic fumes. Your chimney liner does the same thing so it needs to be free and clear of any blockages, as well as structurally sound to ensure all fumes and toxic gases exit your home properly. How do you know when you need a chimney liner? Your chimney is lined with terra cotta flue tiles and are cracked, shifted, and/or deteriorated. Is there anything I need to do to prepare to have my chimney cleaned? We do ask that someone over the age of 18 is home we do need to enter the home. Please do not light your woodstove, fireplace, pellet stove or coal stove 24 hours prior to a chimney technician coming to clean your flue. For a furnace flue you do not need to do anything. Should I have my burner serviced first or the furnace flue cleaned first? Really it doesn’t matter, you can schedule both for the same day, A chimney technician doesn’t touch the burner itself and oil and gas technicians do not go on the roof so because of that we can work together. A chimney cap helps prevent water, animals and debris from entering your chimney. All of our Technicians carry numerous sizes of stainless steel caps, but we can also order caps in copper and black. Repointing is grinding out old crumbling and cracked mortar joints (mortar in between brick) and then replacing it with new mortar.